Grew Up… didn’t, since 9 is actually a small cloth-covered mechanical person called a Stitchpunk. He was created fully formed by a scientist who died upon his completion. 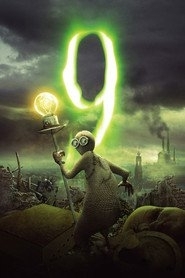 When 9 awakens he finds himself alone in a dead world. Living… in a post-apocalyptic wasteland where everyone is dead and nothing grows. The only things left ‘alive’ are the Stitchpunks and an evil sentient robot called the Fabrication Machine. After venturing out by himself, 9 soon discovers that he may be nearly alone in the world but he is not entirely alone. He soon meets the 8 previous Stitchpunks, created by the same scientist and now hiding out in a church they call Sanctuary. Profession… none, since at the end of the world there’s not much for a newly-awoken Stitchpunk to do professionally. What the Stitchpunks do, they do out of desperation – and there’s always some conflict over what the best course of action is. Interests… saving his newfound friends, finding out the history of the world and how it came to its end, defeating the evil Fabrication Machine. Relationship Status… unattached and not particularly interested. Tiny mechanical people at the end of the world don’t have much use for romance. Challenge… fighting the Fabrication Machine, which is determined to destroy all life on earth. It’s succeeded so far – except for the 9 remaining Stitchpunks. Personality… kind, sincere, and brave to the point of recklessness. As his friend 5 tells him when he heads off into danger yet again, “You forget to remember to be scared.” This fearlessness may be as much naivety as it is bravery. 9 is the youngest of the group, so he still has a lot to learn about the world. This gets him into trouble more than once. Just because he’s naïve, however, doesn’t mean he’s not intelligent. He uses his ingenuity to solve puzzles that baffle the other Stitchpunks. No. 9's popularity ranking on CharacTour is #2178 out of 5,000+ characters. See our top-ranked characters and read their profiles.